Kurofune (meaning ‘Black Ships’) is the word Japanese used to describe the American gunboats that came to open Japan to Western trade in the 19th century. 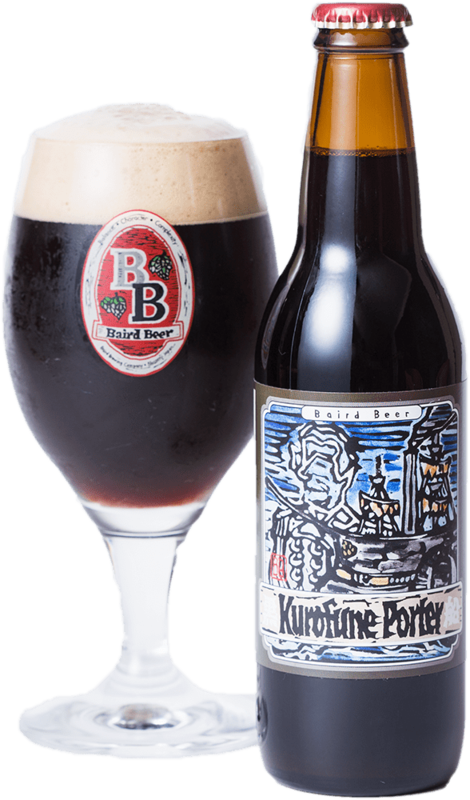 Kurofune Porter is sleek and forceful, but leaves a winning bittersweet taste of chocolate and coffee on the tongue. The history of humankind is tightly intertwined with the evolution of beer brewing. 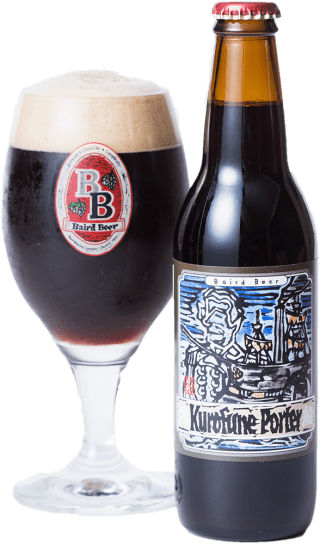 The Kurofune Porter label artwork highlights this interconnection, drawing an association between an important mid-19th century historical moment in Japan and a popular mid-19th century English beer style. Porter is one of the world’s classic Ale styles. Historically, London was the epicenter of Porter brewing. The revival of Porter brewing in modern times is courtesy of the Craft Beer Renaissance. Balance Character Complexity – these three words adorn the Baird Beer logo; they guide me in my approach to the development of each and every Baird Beer. To me, world class beer exhibits always an intricate interplay between balance and complexity. Balance with no complexity is boring; complexity in the absence of balance becomes tiresome. Together, the interplay of the two is what I call character. A beer of character is one you want to drink and continue to drink. ‘Captivatingly drinkable’ would be another way to describe this. Similarly, I am a fan of renowned brewmaster Garrett Oliver’s so called “four pint test,” which holds that if drunk in succession the forth pint of a truly outstanding beer will taste every bit as good as the first. That is the essence of captivating drinkability. Beers with too much upfront intensity fail on this score. 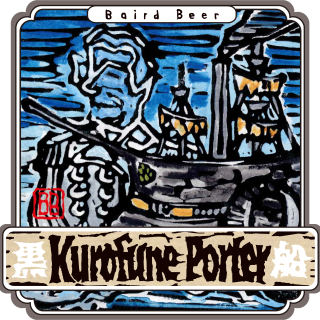 Kurofune Porter is one of the first beers I ever designed. The recipe has evolved over time but not the result – a supremely smooth Robust Porter where the complexity is subtle and understated at first, but increasingly evident with each passing sip. Kurofune Porter will not smack you around, but rather caress you tenderly. they guide me in my approach to the development of each and every Baird Beer. Together, the interplay of the two is what I call character. A beer of character is one you want to drink and continue to drink.